Iran will finds its boats “on the bottom of the Gulf” if it tries to mine the Persian Gulf to prevent oil and gas tankers from sailing. 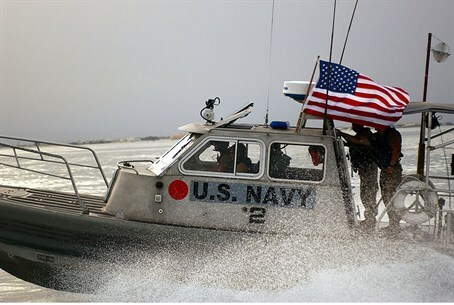 The United States has deployed ships and aircraft in the Persian Gulf region in a clear warning to Iran that “the military option is on the table” if Tehran tried to block the strategic waterway uses by oil and gas tankers, The New York Times reported Tuesday. The deployment of more American warplanes in the Persian Gulf would give the United States a greater ability to strike deep within Iran in the event of a decision by President Barack Obama to attack Iran’s nuclear facilities. The other side of the coin is the possibility that the American military force could cause Iran’s military generals to pull the trigger finger and try to block oil tankers from Saudi Arabia and elsewhere. a move that would cause the price of crude oil – and gasoline at the pump – to spiral upwards less than five months before the U.S. presidential elections. In addition, the United States has deployed more warplanes have been deployed at two regional bases. The Obama administration continues to stiffen sanctions in Iran, but Israel reiterated this week they are too little and too late. Iran continues to try to try to show it is strong enough to defend itself and also to launch attacks on U.S. bases and on Israel. It announced Tuesdays that it successfully fired “tens” of missiles that can strike Israel and regional bases, but the claims were made by the Fars News Agency, linked with the Revolutionary Guards and often a source of unsubstantiated claims. Iran also has threatened to pass a law that would block oil tankers on their way to countries that have joined the American embargo, but there is no indication of how it could enforce such a law. One major factor working against Iran is that virtually all of the Gulf States are aligned with the United States and have a common interest with Israel to prevent Tehran from obtaining nuclear ability and advancing its dream of establishing an Islamic empire in the Middle East.